I recently added “zone masks” to the custom actions panel using the buttons shown at the right. I’m starting to find them quite helpful in developing images and thought I’d offer a more in-depth discussion for people not familiar with them. The original luminosity masks tutorial describes how to create a series of light and dark selections based on an image’s tonal values. While these selections are a handy way to target tones for adjustment, the primary masks are not the only tonal selections possible using these techniques. In fact, once the initial masks are generated, a whole new level of tonal selection becomes accessible. Some of the most useful secondary selections are off-center midtones created by subtracting one selection from another. The Magic Midtones tutorial describes how to do this. It’s also discussed in the Questions and Answers About Luminosity Masks tutorial. Basically, the process involves first creating a tonal selection and then subtracting another tonal selection with fewer selected pixels from it. Generally this is done using masks on the Channels panel. Ctrl-click (Mac: Command-click) loads the first mask as a selection and then Ctrl+Alt-click (Mac: Command+Opt-click) on a second mask subtracts the second mask’s selection from the first. The new selection is midtone-like. It is not anchored to either the light or dark tones in the image the way the Lights- and Darks-series masks are anchored to one end of the tonal spectrum. Instead, the selection tapers into both lighter AND darker tones surrounding the desired selected tones. In addition to insuring excellent blending into the surrounding tones, this dual-tapering also makes it easier to control image contrast. For subtracted masks in the light tones, the lightest tones are subtracted off and won’t “gray down” significantly with a darkening adjustment. For subtracted masks in the dark tones, the darkest values are subtracted off and won’t “gray up” as much when being lightened. By using subtracted masks for adjustments instead of the primary luminosity masks, the darkest darks and lightest lights can be better maintained so that overall image contrast is preserved. 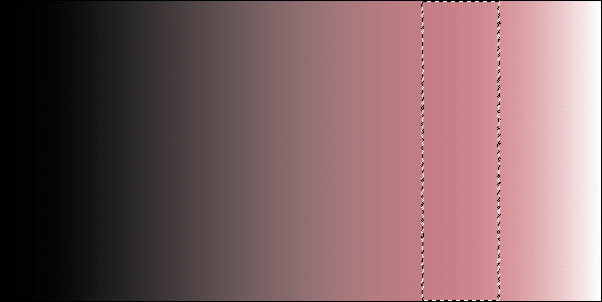 Below is an image of a black-to-white gradient with the selection edges showing a subtracted selection of the Light Lights minus Super Lights. The red in the image shows the tapering effect into both the lighter and darker tones. Notice how the very lightest tones are excluded from the selection and the taper because the Super Lights were subtracted off. With the primary masks (five Lights-series masks and five Darks-series) there are many possible secondary subtracted masks. Robert Fisher took some of the possibilities and organized them in to what he calls The Digital Zone System, and published a book by this title in December 2012. 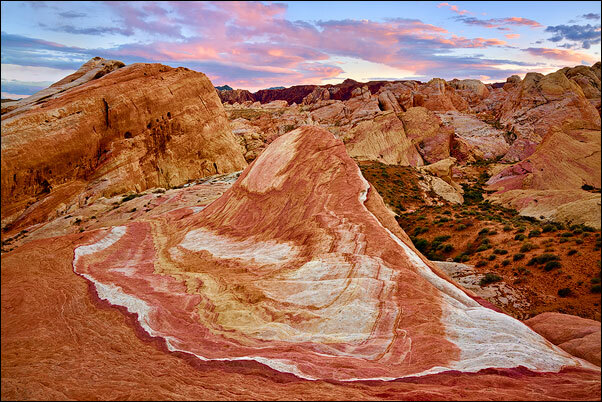 He connected specific subtracted masks with the zones of Ansel Adams’ zone system for black and white photography. While there are notable differences between the two that I discuss on page 18 in this PDF, having a defined spectrum of subtracted masks can make it easier to decide which one to choose for a specific adjustment. The table below describes the different zone masks/selections (DESCRIPTION column) and how they are created using the primary luminosity masks (METHOD column). The image above is used create the the zone masks. The the black and white images in the table show red in areas that correspond to the pixels selected by the mask. This helps visualize what parts of the image will be affected by adjustments through the corresponding mask. I hope you’ll give zone masks a try. They offer a unique, flexible, and effective way to control brightness and contrast in an image. Zone masks are a good place to start understanding subtracted masks since the zones provide a practical method for deciding which subtracted mask to choose. I’m finding zones 1, 2, and 3 in the Shadows and zones 7, 8, and 9 in the Highlights especially helpful in my own photos. These particular masks allow me to target tone zones that often make a difference. Nice stuff Tony. I used this today on some of my images and it did a great job of bringing up some shadows but leaving the really dark areas dark for good contrast. I am just amazed at how useful this panel is becoming in my workflow. Thanks again. When I first saw the latest TKActions (2014), I was surprised and excited to see the “Zone System” there as a new masks panel. They are a brilliant addition. I am using them more and more; and as you say in your further June 26, 2014 explanation of them, I’m finding zones 1, 2, 3 and 7, 8, 9 the most useful… although 4 and 5 have come in very handy. Great, great easily applied isolation of tones.